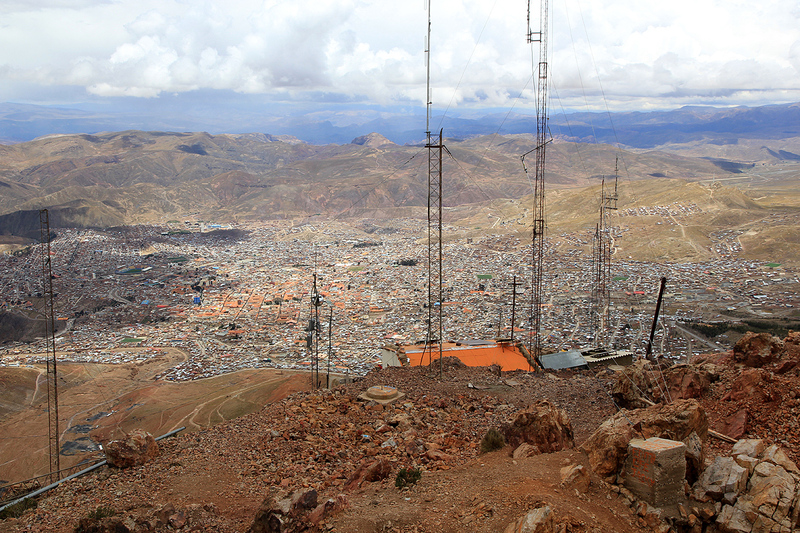 How to get there: This mountain is located near the upper part of the city Potosi. 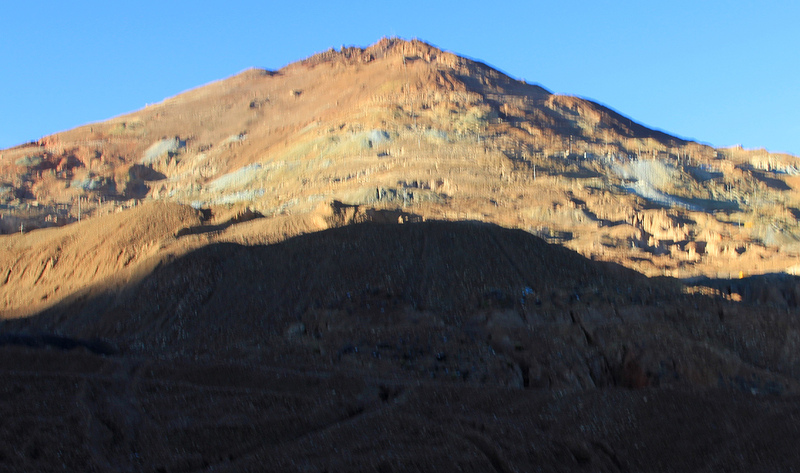 This mountain has some of the richest silver mines of all times. A picture of the mountain can be seen on Bolivian coins. 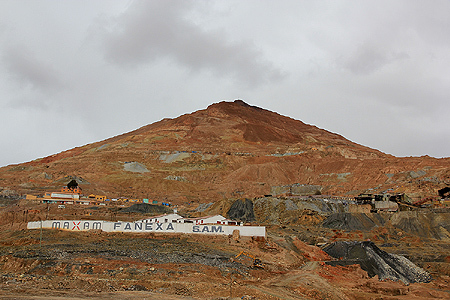 A large part of its slope has been completely changed due to extensive mining activity that has lasted for several hundred years. 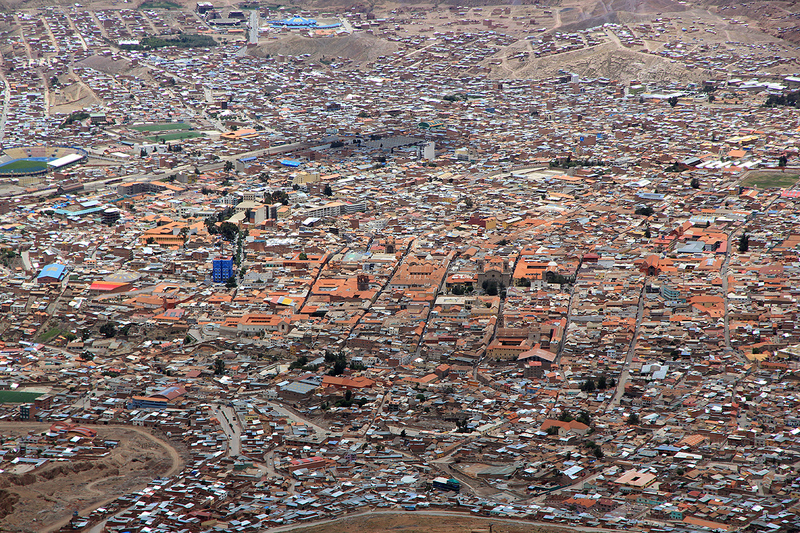 The city Potosi itself is considered the highest (large) city in the world with an (average) elevation well above 4000 meter. 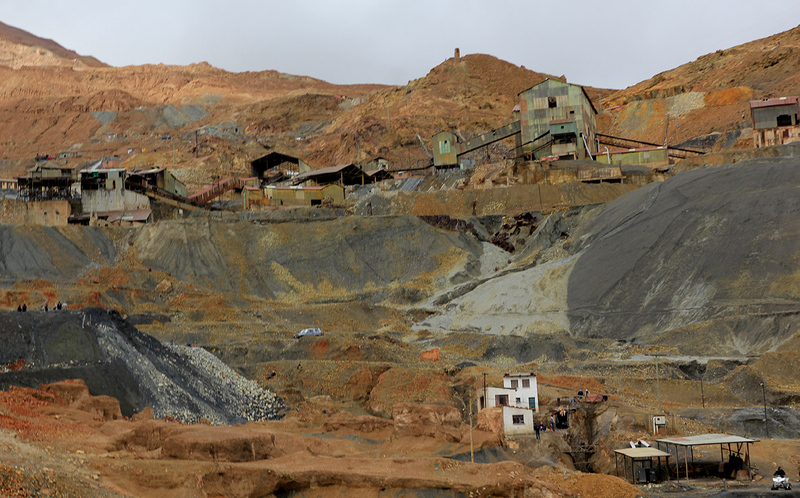 Drive to the main entrance to the mines as well as the mountain, a right turn off the main highway and across a small bridge. The first natural place to stop and ask about how to climb the mountain, may be at or near location S19:36.449 W065:44.725, elevation about 4200 meter. We picked up a local boy at this spot, eager to earn a descent vage and act as a local guide. We then drove a bit higher before parking at location S19:36.541 W065:44.857, elevation about 4270 meter. We headed uphill, often making short-cuts on loose scree between the various switch-backs that the mining roads are making. Eventually, the road ends and a pretty clear trail continues uphill. Near the summit, there is a small hut. Continue around this hut (left side) and ascend the final slope leading to a pretty pointed highest point. The highest part of this peak has been built by humans. Touch the top and/or highest natural ground a bit lower. 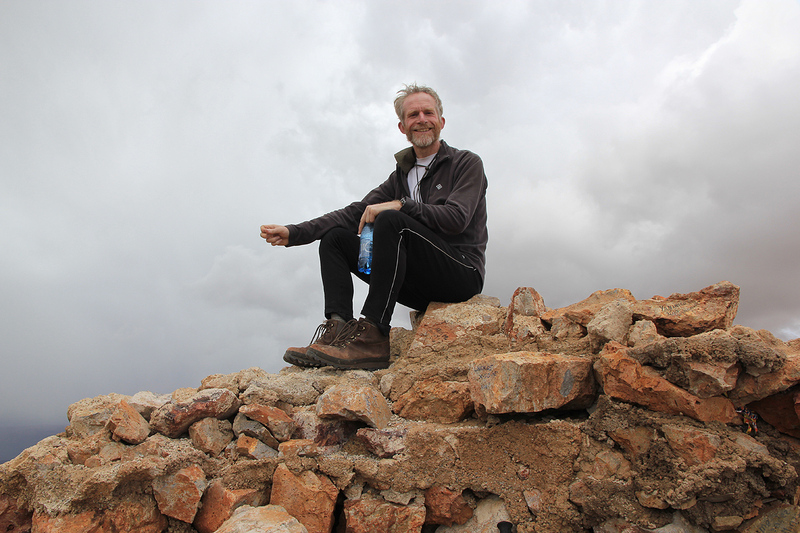 We left around 1115 and reached the summit at 1220, good vertical pace, but easy terrain. 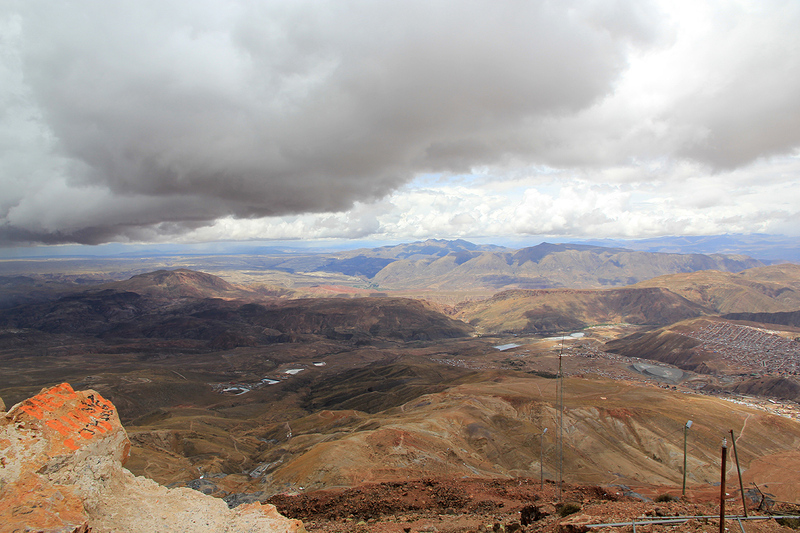 The view back down to the city of Potosi as well as the surrounding landscape was well worth the hike. We left the summit at 1235 and were back at the car in one hour, by 1335. I picked up a pretty large rock that clearly holds minerals of some kind. This rock has been carried home and serves as my memory of Bolivia, in particular of Potosi where we support a SOS Childrens Village. 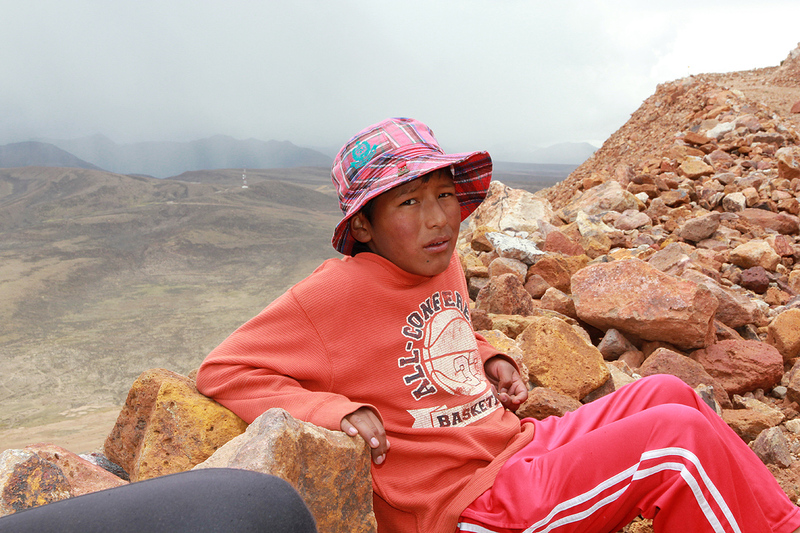 We agreed with a young, 13 year old boy that he could act as a local guide. An excellent opportunity for a young boy to make some extra money. We paid him well, gave him 100 Bolivianos, hopefully, he took it home to his family. This completed our hikes of peaks below 5000 meter, we also hooked up with the other half of our party, Adam, Greg and Duane, in Potosi this evening. Thus, the rest of our trip would be a 6 person, 2 vehicle expedition. Cerro Rico, from the city. 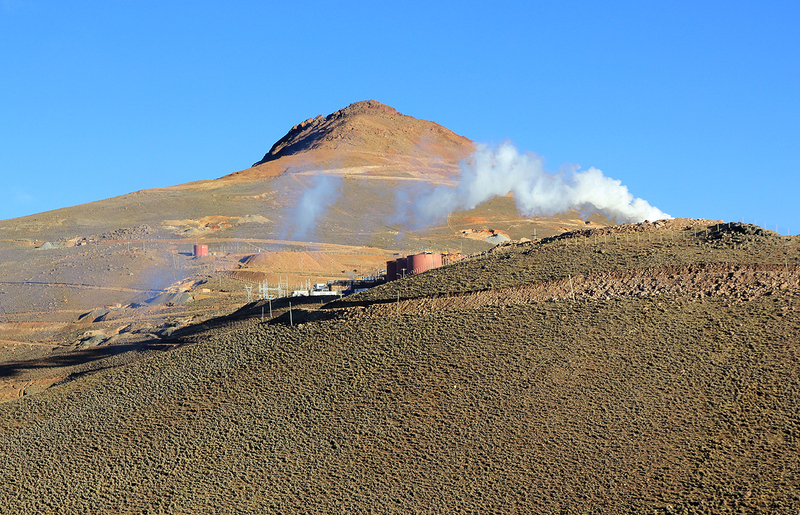 Cerro Rico, as seen when travelling south.